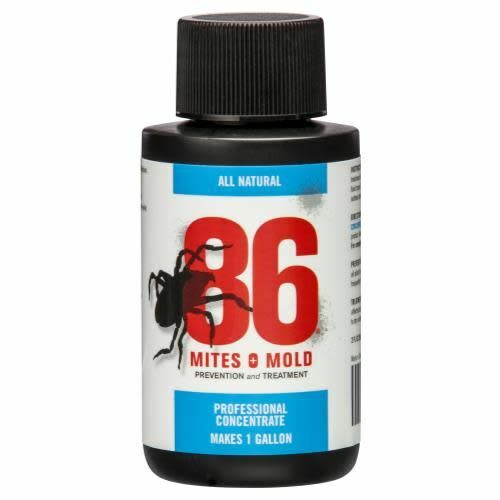 86 Mites & Mold is a natural oil based broad spectrum pesticide which eliminates a wide range of insects including spider mites, aphids thrips, broad mites, russet mites, white flies, grubs, many kinds of ants, etc. Spider mites die on contact. Eggs are suffocated within 12-24 hours. Apply as a treatment or as a preventive every 2-3 days or as required. 86 Mites & Mold may also be used as a treatment or as a preventive to control powdery mildew. 86 is all natural, food grade safe, easy on plants and smells great. 86 contains NO potassium, NO citric acid and NO isopropyl alcohol. 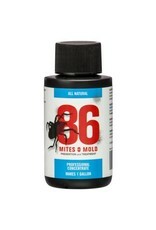 86 is available as a Ready-To-Use spray or as a concentrate. 86 contains 4 natural oils and 3 emulsifiers and does not require EPA registration.